BP: Sweet Opportunity or Sloppy Mess? Discussing the BP oil spill is not exactly cutting-edge, fresh news at this point. However, now that the 5 million barrel gaping gusher of black sludge has been plugged, many of the uncertain variables are beginning to come in focus. From mid-April this year, right before the disaster occurred, the equity value of BP’s stock peaked around $189 billion. The value of the company subsequently shed over $100 billion in value over the next two months, before rebounding to a level about -35% below the April highs today. BP is not out of the woods yet, even though the discussion has migrated from potential bankruptcy scenarios. The question now is whether purchasing BP stock currently is a sweet opportunity or just a sloppy mess that will drag value down for years to come? Pretty convincing evidence that the bark was bigger than the bite for these examples, but Tilson chose to save his best precedent illustration for last…Merck (MRK). In 2004, the pharmacy company came under assault after it was revealed the drug Vioxx increased the likelihood of patient heart attacks. What fanned the flames of panic were the allegations that Merck had known about these detrimental risks for years, but the company did not disclose this valuable knowledge. To make a long story short, the initial $50 billion liability estimate attributed to Merck actually came in closer to $5 billion and the stock rallied from a low of $26 in 2005 to $60 by the end of 2007. Tilson however, conveniently neglects to mention that the company’s stock shortly thereafter collapsed, before bottoming at $20 per share in early 2009 and settling in at a price around $35 today. Regardless, Tilson’s points are well taken. Often these major catastrophes that sprawl across media headlines become overdone and offer an opportunity to those investors with thick skin and a stomach that can withstand severe heartburn. BP is a Cash Cow: The average estimate of BP’s liability (approximately $30 billion) is less than the $34 billion in operating profits ($20 billion in net income) expected to be realized by BP in 2010. Financial Flexibility: BP has access to over $20 billion in access to cash and liquidity, not even counting the more than $100 billion in property, plant, & equipment (PP&E) on the balance sheet. Asset sales provide BP with even more flexibility. 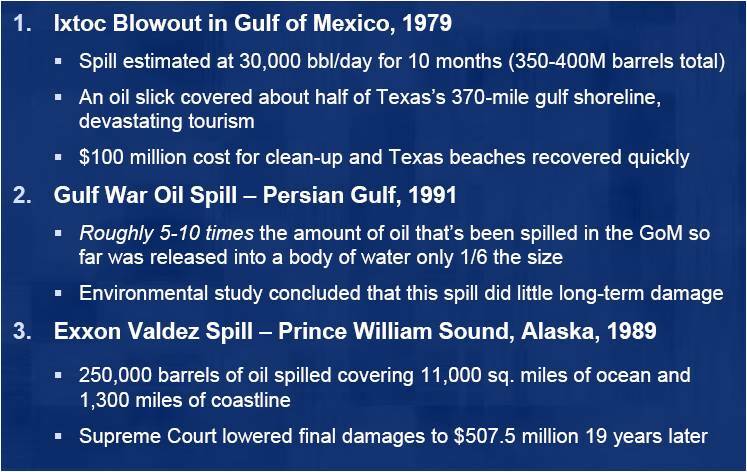 Small U.S. Footprint: BP’s Gulf of Mexico operations, home of the Macondo well disaster, represent only about 15% of BP’s total global oil production, so the inference is BP would do just fine without access to the Gulf. All, in all, Tilson provides a perspective with logical arguments to support his case. The analysis, however, does not give a lot of weight to political consequences that can cause this situation to go from bad to worse. Specifically, some pundits are using a more negative legal precedent of the tobacco companies to explain the downside potential of this situation (see legal pay-out table). 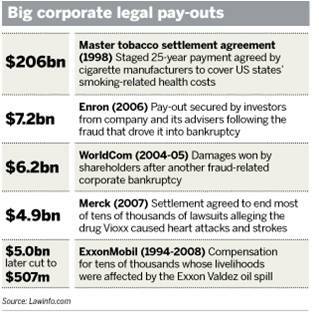 The 1998 master tobacco settlement agreement with the tobacco industry resulted in a whopping $206 billion in pay-outs to be made by the tobacco manufactures over 25 years (Financial Times). This is significantly greater than the $20 billion escrow account that BP has verbally committed to funding (and BP has already funded the account with a $3 billion initial deposit). What’s more, the spill volume estimates are a moving target, and as a result, BP just raised its oil spill cleanup costs from $3.95 billion to $6.1 billion. These numbers can have a way of becoming their own monsters over time. As you can see, Whitney Tilson makes some pretty compelling arguments for BP, but not many arguments can be made against his long-term performance at the T2 Accredited Fund, which is up +202% since 1999 through mid-2010 (versus +7% for the S&P 500 for the same time period). If you believe Tilson, BP may turn out to be a sweeter kiss than the sloppy mess we constantly hear about. *DISCLOSURE: Sidoxia Capital Management (SCM) and some of its clients own certain exchange traded funds, but at the time of publishing SCM had no direct position in BP, MRK, XOM, or any security referenced in this article. No information accessed through the Investing Caffeine (IC) website constitutes investment, financial, legal, tax or other advice nor is to be relied on in making an investment or other decision. Please read disclosure language on IC “Contact” page. Entry filed under: Stocks. Tags: BP, British Petroleum, Exxon, Gulf of Mexico, liability, Macondo, Merck, oil spill, T2 Partners, Whitney Tilson.